The Sigma 19mm f/2.8 EX DN Lens and 30mm f/2.8 EX DN Lens Kit for Sony Alpha E Mount from B&H Photo bundles together two fast lenses for greater flexibility when shooting with Sony NEX mirrorless cameras. The 19mm lens is equivalent to a 28.5mm lens in the 35mm format and provides wide-angle focal length photography with a bright maximum aperture of f/2.8 for clear low light photography and shallow depth of field focusing. The 30mm lens also has a fast maximum aperture of f/2.8 and offers a standard focal length of 45mm in the 35mm format. Both lenses are designed with aspherical optical elements for sharpness and minimal distortion and both feature a smooth, quiet Linear Autofocus Motor ideal for shooting video. 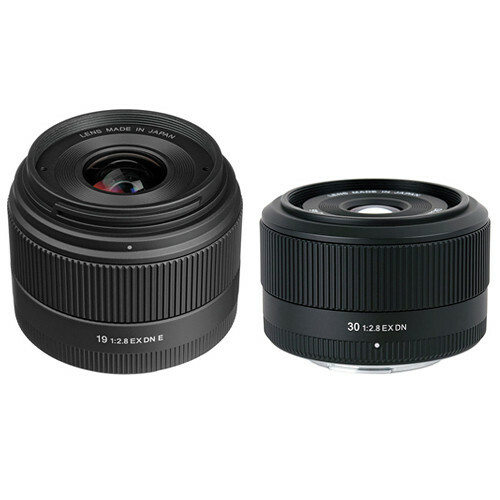 19mm f/2.8 EX DN Lens and 30mm f/2.8 EX DN Lens Kit for Sony Alpha E Mount is rated 4.5 out of 5 by 2. Rated 5 out of 5 by RedDevil from Best Quality/Price Ratio! I got these lenses because of the glowing reviews so I don't have to say much here. I am no professional photographer but I can definitely tell the lenses are sharper than Sony's 18-55mm kit lens. For a price less than one lens from Sony, the price is unbeatable. I particularly like the 30mm. It's smaller than the 19mm and much better apeture than the kit lens at 30mm. The 30mm becomes my walking around lens. Rated 4 out of 5 by Jonathan F.V. from Very good deal! It's awesome to have fairly fast and sharp lenses for that price, it's definitely worth it. I like using them for shooting night timelapses, they give me sharper images than my Nikkor 50mm f/1.8. They have a good working autofocus and they feel pretty sturdy. For the cons, I only have one. Changing the aperture is a bit noisy and can be heard clearly while filming. It's not that big of a deal since I usually set up my camera to film in manual mode and don't change the settings during the scene, but I can assume someone filming in shutter priority mode could be annoyed by the noise they make while changing the aperture. Because of that, I have to give these lenses only 4 stars, but I still think they're worth the money for what I do with them.